We are now going into our second week of Astronomy. I'm learning I really didn't learn anything about any of this attending public school, and therefore am learning A LOT now. I feel like I'm in college all over again staying up late each night studying. Thankfully, it's been very enjoyable. The kids are doing very well with their letter sounds, but it seems like forever since we did a beginning letter sound activity. I couldn't resist this one as it corresponded perfectly with what we're learning this week. 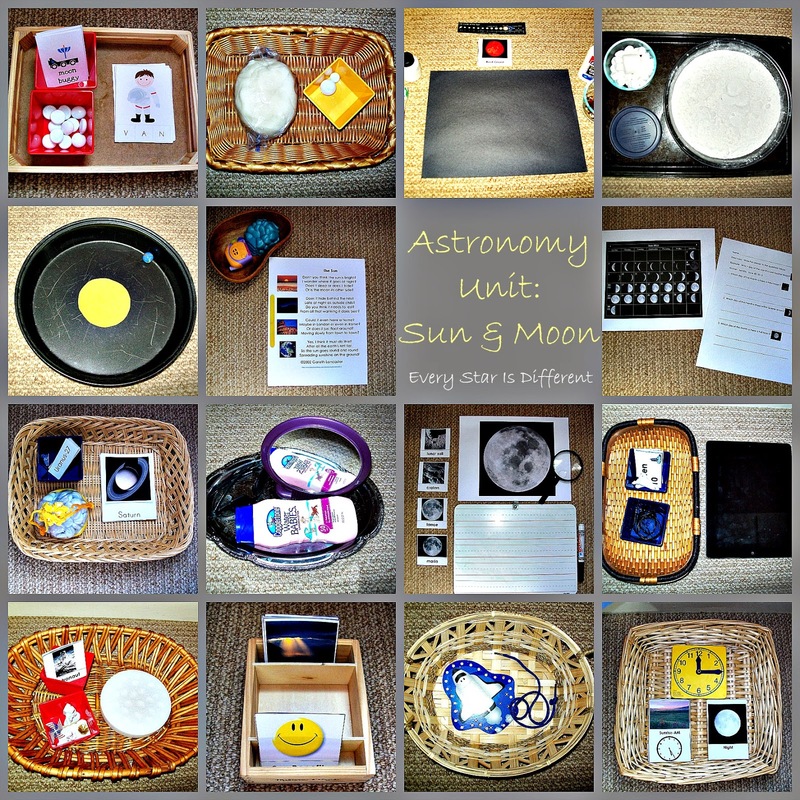 Source: The printables for this activity are part of the Astronaut Printables at Homeschool Creations. I must admit, I worked very hard to disguise a writing activity, knowing the kiddos really don't enjoy writing very much. Even without the writing, the activity still works. The kiddos will look at the four cards to the left and identify the terms: lunar soil, crater, tarrae, and maria. They will then use their magnifying glass to identify the same items in the large picture of the moon. As they do this, I am going to have them write down the names of the four terms. For those who can't write well, they will practice writing the first letter of each word. Source: I made the printables for this activity. For a free printable of this activity click HERE. The kiddos seemed to like our first attempt at poetry a couple weeks ago, so I'm moving forward with it. This poem is not written by me, but worked perfectly with our theme this week. I've included a "house," "hill," "earth"-marble, & "sun"-marble to place next to the different parts of the poem. Sources: This poem can be found at fizzyfunnyfuzzy.com. I added the pictures for each paragraph. For a free copy of the poem with added pictures click HERE. Bulldozer loves the moon. I wanted to give him more information to apply to his middle of the night moon observances. This will be a great way to present the moon cycle. After his initial lesson about the moon, he woke me up at 4 AM to tell me what kind of moon was shining in the sky. I love when he becomes passionate about something he has learned, especially when he has his facts straight. Sources: The phases of the moon calendar can be found at Auntie Moon. I created the worksheet to go with it. For a free copy of the worksheet and phases of the moon calendar together click HERE. I saw this activity and thought it super cute. It will be a great way to introduce the planets before our planets theme next week. I spent a lot of time researching how many moons are on each planet and found some contradictions in data. In the end I decided to go with information regarding moons with names. Moons without names, I did not consider official, and therefore are not counted. Originally I was going to use marbles as counters but I soon realized it would become very frustrating as they would roll all over the place. Instead I used my favorite glass beads. Sources: The idea for this activity came from Sorting Sprinkles. The planet cards can be found for free at The Helpful Garden. I made the moon labels with number cards. What Time is it Day & Night? Dinomite and Princess are doing great at understanding the concept of time and telling time using clocks. We have not addressed the concepts of day and night though, and so I figured this would be a great time to teach it. I looked up the times of sunrise and sunset for each season and printed them on each of the cards, along with a picture of each season. As they identify the times on each of the clocks, they can separate the time by day and night or AM and PM. I used different clocks for the most of the cards so the kiddos would start to get used to the variety of clocks there are. The times are written on the back of each card for control purposes. Source: I created this activity. For a free copy of the printable click HERE. We are big lovers of Laurie Berkner in this house. As I was preparing this unit, I could not get her "Rocketship Run" song out of my head. Around the same time the kiddos were watching the timer on the stove, waiting for cookies to come out of the oven. They were noticing the clock on the stove going backwards. It then occurred to me we've never worked on counting backwards before. I couldn't resist designing an activity counting down to blast off to the moon! The Laurie Berkner song "Rocketship Run" is actually the control in this activity. I've bookmarked the video on our iPad. I'm also counting it as part of our music time and the kids will be listening to it over and over again learning the words. After listening to the song, the kiddos will be asked to arrange numbers one to ten backwards to lift off. I've included a little space shuttle, so when they complete the task they can pretend to have their space shuttle go into space. Source: I created this activity. For a free copy of the countdown cards click HERE. No one selected this activity last week while on vacation, so I decided to put it on the shelves again. The sun is a star, so in that way it works. Source: This activity was inspired by an idea at Fantastic Fun & Learning. I loved this activity when I saw it. It's perfect for Bulldozer and will help the kiddos understand this process so much better. The sun is attached to the middle of a round cake pan. The marble on the outside represents the Earth. The kiddos will practice putting the Earth into orbit around the sun. It may appear easy, but I'm guessing it will take them a little bit to get the hang of it. Then I predict loads of fun seeing how fast and slow they can get the Earth to move around the sun without stopping or going off the path. Source: I found this activity at Journey to Josie. We've done this activity before. Bulldozer has requested it again and again. This was the activity that inspired his 4 AM activities. I know he'll be super excited to see it again. Source: I found these free printable cards at Noor Janan Homeschool. There are some units where coming up with social studies lessons can be difficult. Others it's science lessons. In an effort not to neglect the subject I decided to teach the kids about Neil Armstrong. However the kids barely understand the concept of stars and space, let alone how one would get to space. As an introduction to this idea and to Neil Armstrong, we'll watch the video clips about him. I've gotta say this is one of my favorite activities! I've used a Styrofoam circular shape to represent the moon. It has indentations and everything to look more real. There are six cards that show pictures or words that relate to Neil Armstrong's trip to the moon. The kiddos will identify them and discuss their contents. In another cup, I've included an astronaut, a moon buggy, American Flag Toothpick (pinwheel actually), and the space craft Neil Armstrong took to the moon. The kiddos will be able to act out the adventure on their own little moon, and hopefully remember it. The sun is a tricky subject to teach kiddos with anxieties and OCD tendencies. I've prepared this activity to ease any anxieties some kiddos may have about the sun, explaining both the good and the bad. The kiddos will separate the cards into categories. An activity below will help the kiddos address what they can to to protect themselves from the sun. As we talk about the sun and how it can burn our skin and eyes, the kids will practice putting sunscreen on their faces, and also sunglasses, as they seem to struggle with this task. I've provided the mirror so they can see what their doing and check to see if the sunglasses are on correctly. It's only fitting we'll go outside after learning time is finished. Source: I created this activity but with inspiration from Counting Coconuts. I found this a while back and knew it would be great for our space unit. Source: I found the lacing card at our local dollar store. When I saw this idea, I just knew I had to try it out. Sure enough it was PERFECT! The round cake pan is full of flour to represent the moon's lunar soil. The marshmallows in the bowl to the left, represent impacts to the moon. The kiddos throw the marshmallows into the "moon" and watch how it affects the "lunar soil." It will be a messy activity, but definitely memorable. I included one large marshmallow to mimic the North Pole impact. Source: I neglected to pin where I found this activity. It is not my original idea. If someone does know the source, please feel free leaving a comment stating source. Similar to the activity above in some ways, the kiddos will make the moon using home made white glitter play-dough. I've included 2 marbles of different sizes they can use to create the craters. I included both activities because they stimulate different sensory areas. The flour activity is very visual. The play-dough activity is very much a touch activity. Source: I found this idea at Sorting Sprinkles. We've learned that the sun is a star, and that it goes through the same cycle. In this activity we're going to create the night sky with varying stars at different places in their cycle. The toothbrush will be the means of painting stars. I've included the cycle of the star cards from last week, along with a print out of the cycle of the sun and where it is now, just in case the kiddos want to include that in their art work. To the right I've included glue and sequins the kiddos can add to their work. It should be fun! Source: I found the idea for this activity in a book called, Arty Facts Space & Art Activities by Crabtree Publishing. The activity in the book also includes pastels, but I have opted to not use them. 1 The Boy and the Moon by James Christopher Carroll. It's going to be a FUN week! Thanks so much for stopping by. I LOVE reading your comments! Awe. Thank you so much! I love meeting my readers and will be sure to check out your blog. Comments mean the world to me. Wow! Amazing activities and resources. Thank you for sharing. Great resources! Thanks for sharing at After School! absolutely great set of activities ! thank you so much, they will come in handy here. thank you for sharing all your marvelous work. i guess i should say it more often, because me thinking it does not make you hear it ! thank you for these great ideas and freebies!! !